I wore this understated little outfit to work yesterday. The dress was one of my birthday shopping finds. You can't quite tell from the photos, but the polka dots are actually hearts -- too cute! Coming up in the next few days: what I wore for my birthday night out and my birthday party from this past weekend. I picked up almost the exact same dress from H&M a few seasons ago. I love how simply you styled it with the statement necklace and loafers - great inspiration to keep in mind. It looks so effortless! What a perfect outfit for a day at work, still trendy and cute but classic as all get out. Inspirational for sure. Happy birthday. I love that the dots are actually hearts. It makes the polka dot pattern feel fun and alittle more girly. I love this with the red heels. I love this dress! The heart pattern is too cute. And I love it paired with your awesome red loafers. where did you get your tights? i have a pair just like them, but i ripped them recently :( and i'm on the prowl for a new pair. Ohh, your dotted dress is truly a delight! <3 and I love love love the necklace too! Adorable! I really like the necklace over the dress! Awwww cute little hearts!! That's such a great dress, I love it with your necklace too. Such a wonderful look, happy birthday! So cute, love the necklace! LauraBee - I can't remember! Maybe Target? They're just plain black, although the lighting in these photos makes them look a little different. happy birthday lady! I hope you had a great weekend, can't wait to see your bday outfits! 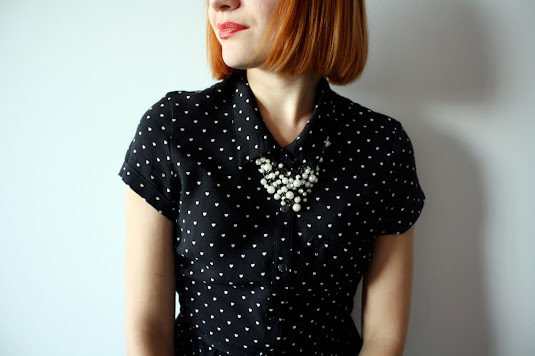 That polka dot dress is so classic and looks wonderful on you. I'm really loving the shoes you paired with it. Beyond adorable! I love this outfit, especially the styling with the grey tights and red shoes! Aw, what a gorgeous little dress! I'd have picked it up too.